Using the opportunities offered by the Law n. 482 of 15.12.1999 for the protection of the historical language minorities, since March 2004 a Language Counter has been working with two different offices, the first at Scuola Latina and the second at the Cultural association La Valaddo. both depending on the central seat of Comunitá Montana del Pinerolese. The Counter offers support to Pubblic Bodies (Boroughs, Parks and other Institutions) for translations, training and language advices, pormotes and enhances the minority languages, which for the Valleys Chisone and Germanasca are Occitan (in its Alpine Proven�al version ) and French. The activities and projects of the Counter takes advantage of the Patou?Library, which is a multimedia documentation centre name after Professor Arturo Genre. Training classes concerning both Occitan and French, recently organised in joint work with the Language Counter of the Pellice Valley and with Waldensian Cultural Centre of Torre Pellice, which is in charge for the training projects. 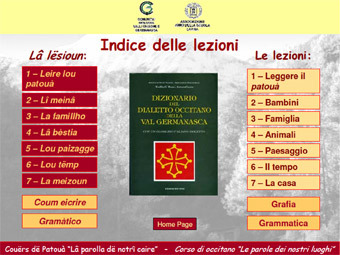 An on-line Occitan course is available and it refers to the language spoken in Germanasca Valley; the spelling used is one based on the spelling of the Escolo dou Po. Documentaries on traditional works in Germanasca Valley realized according to a Project of the Comunitá Montana Valli Chisone e Germanasca. The on-line Occitan course "The words of our places"
Pandora UK trends that fit you, With regards to fashion, Louis Vuitton Bags lady effects her different portion of choices and priorities. True Religion Jeans Trends come and go that will not mean that not really single trend will be spared. There might be some trends Tiffany Jewelry Outlet that could suit a person whereas carrying out a blind fashion chase may ruin the entire outlook. With regards to women��s fashion, Monster Beats Australia there exists a lot which is put in mind. Prior to going out for Pandora Charms shopping, a female should analyze and calculate her needs and suitability. Undoubtedly there might be chances when jewelry shops that provide diamond or artificial jewelry will seem extremely charming and imposing for you, Prada Outlet but selection needs to be wise.